The study of Indiana's geology is commonly divided into the study of the unlithified earth materials that occur at the surface and the study of the rocks that are sometimes at, but mostly below, the surface of Indiana. The term "bedrock geology" describes the study of the rocks at and below the bedrock surface. 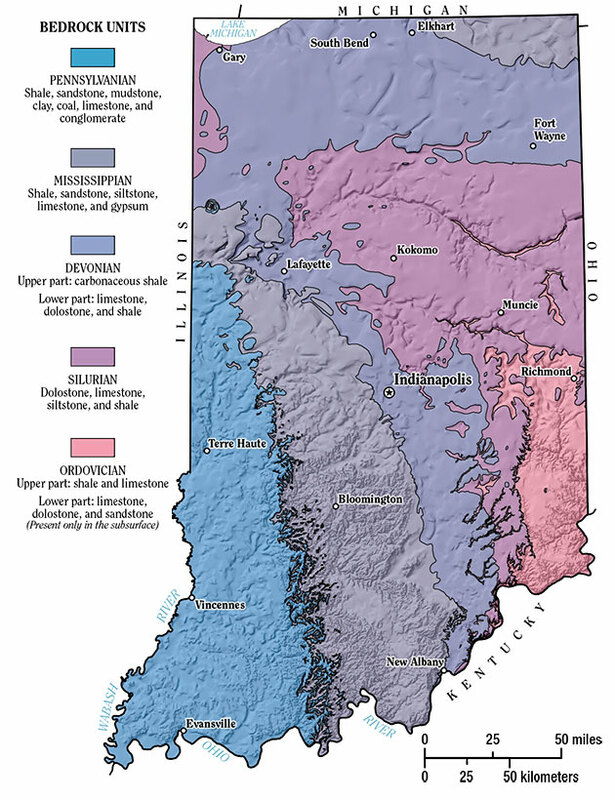 There are several important aspects to Indiana's bedrock geology. One is the topography of the bedrock surface. The bedrock of Indiana experienced erosion at least since late Pennsylvanian time (~300 million years ago) and was covered by unconsolidated materials only during the past 2 million years, when two major glacial advances and retreats crossed the state. Bedrock is exposed only in the south-central part of the state, which was not glaciated, and in localized areas along the Wabash River. Geologists map the bedrock surface by using topographic maps, data from drilled holes, and geophysical methods; these maps show an irregular surface crossed by numerous drainages. The highest points on the bedrock surface are in Randolph and Wayne Counties, whereas the lowest points are along the Wabash and Ohio Rivers in Posey and Vanderburgh Counties. A striking feature of the bedrock surface is the ancient Teays River Valley that cut through Adams, Jay, Blackford, Grant, Wabash, Miami, and Cass Counties. This valley was buried by glacial debris, but the Wabash Rivers still courses through parts of Teays River Valley. The types of rocks and their spatial distribution is another part of Indiana's bedrock geology. Known as "stratigraphy," the study of the changes in rocks through time, both laterally and vertically, provides information on past environmental conditions and processes, and on the distribution of mineral and energy resources (see Bedrock Geologic Units). A component of stratigraphy is assigning names to sequences of rocks (see Geologic Names Information System). The most common named unit is a "formation." A formation commonly consists of one or more rock types that have a distinct character. These units may be tens to hundreds of feet thick. A third aspect of bedrock geology is the rock structure that pertains to the bends and faults that occur in the stratigraphic units. Indiana is a broad anticline with a slight plunge to the northwest. The anticline is very broad and is, therefore, more appropriately called an "arch." In the southeastern part of Indiana, this arch is known as the Cincinnati Arch and in the northwestern part of the state it is called the Kankakee Arch. Indiana also contains several named faults, such as the Mt. Carmel Fault that extends from Morgan County south through Monroe and Lawrence Counties into Washington County, and a concentrated area of faults in the southwestern part of the state, known as the Wabash Valley Fault System.